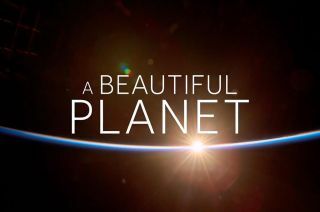 A new trailer for "A Beautiful Planet," narrated by actress Jennifer Lawrence, previews the IMAX 3D space film about Earth. "A Beautiful Planet" is a stunning glimpse of Earth from space, bringing a heightened awareness of our planet—and the effects of humanity over time—as never seen before. See photos from the film here. THIS IMAGE: An awe-inspiring view of a sunrise from the International Space Station revealed in "A Beautiful Planet." European Space Agency (ESA) astronaut Samantha Cristoforetti photographs Earth from the Cupola onboard the International Space Station in "A Beautiful Planet." Christoforetti and other astronauts share what the view is like, and how it affects them. NASA astronaut Kjell Lindgren poses with the IMAX camera on the International Space Station used to help film "A Beautiful Planet." Narrator Jennifer Lawrence and Writer/Director Toni Myers run through the script for "A Beautiful Planet" while preparing to record the film's narration. NASA Commander Barry (Butch) Willmore on a spacewalk to repair the exterior of the International Space Station. It’s almost 300 degrees F on the sun side of the space station and minus 275 degrees F in the shade. The vivid colors of the Bahama reefs as seen in "A Beautiful Planet." The entire northeast of Canada, the United States and beyond as seen from the International Space Station. Earth's climates can be seen from space. In this image, the great lakes of North America lie trapped in ice and snow. The 25-mile wide eye of Typhoon Maysak as seen from the International Space Station in "A Beautiful Planet." An astronaut's breathtaking view of Los Angeles, the California Coast and Central Valley from the International Space Station as witnessed in "A Beautiful Planet." A view of Earth from the International Space Station as seen in the IMAX film "A Beautiful Planet."